Wouldn’t you love to have a salad named after you? It’s the Holy Grail or is that just a dietitian thing? Poor Mr. Cobb. You’ve got to love him. He created this salad as a way to use up leftovers. Clever right? And with food waste estimated at about 40% we need all the help we can get. His original salad creation from the 1920’s in Hollywood’s Brown Derby Restaurant gets butchered over and over again. Now here I go making him roll in his grave, yet again. He’s probably thinking, oh it’s a dietitian this time I bet she’s going to oust the bacon and he’d be right. Sorry Mr. Cobb. Kids already get too much salt. Will your child bring a version of Cobb’s salad to school for lunch? I bet other folks would love to know what Cobb salad combo your child likes to eat. Kindly share your ideas here. Dietitian’s Tip: When cleaning up after dinner you may wonder why keep a few slices of beet root or avocado or one small piece of meat? Now you have a reason and Mr. Cobb would be proud. Use up those leftovers folks. Keep a container in your fridge for all the little bits that will go into a Cobb salad and aim to use them up in 2-3 days. Kids Cook! *Tell the story about Mr. Cobb to your kids and ask them to create their own version of a salad named after themselves (of course!) with any combination of cheese, vegetables, protein, and plenty of greens. Homemade vinaigrette. Get your kids to make it! Try this easy DIY vinaigrette from the kind folks at Canola Eat Well. 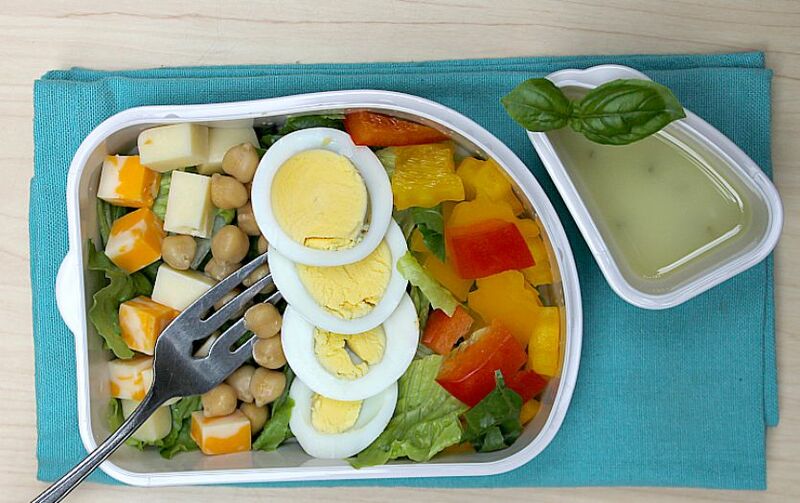 Portion out the lettuce into 4 containers, top with sliced eggs, chickpeas, peppers and cheese. Seal and store in the fridge. Pack up the vinaigrette separately. * These ideas are meant as a guide only. You know best what your child can safely manage. Make sure your child understands the rules for working in the kitchen safely and always supervise kids in the kitchen.